When it comes to eating well and being healthy, nobody is perfect, not even Dietitians. Some days we eat our five serves of vegetables, some days we fall a little short. But it’s what you do the bulk of the time that counts. Day to day, the choices you’re making about the food you’re putting into your body and the healthy behaviours you’re engaging in. That’s what counts. 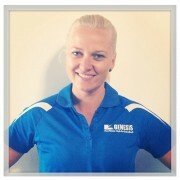 Hi my name is Kimberly and I have been working with Genesis Fitness since March 2012. I am hugely passionate about health and fitness and love being part of this industry. I started with Genesis in the group fitness department and teach all forms of freestyle including Step, Cycle, Fatburner, Total Body, Tone and Core, Body Blitz and BAT. I also teach all of our signature series which so far includes MF45, BX45 and shockwave. My specialty though is Pilates. I danced throughout my whole childhood and was introduced to Pilates at the age of 10. I quickly fell in love with it and began teaching at age 16 and have been teaching ever since. Within Genesis I have had many roles since joining including reception and assistant member care and I am currently Group Fitness Coordinator (GFC) and Fitness Division Coordinator (FDC) for Mayfield. Summer bodies are made in winter!! !